Even though the first time I visited "Cave Park" was about 15 years ago, it wasn't until this morning that I learned the real name of the park is Arapahoe Ridge Park. Cave Park as we so lovingly call it, is one of the most unique parks we've ever been to. 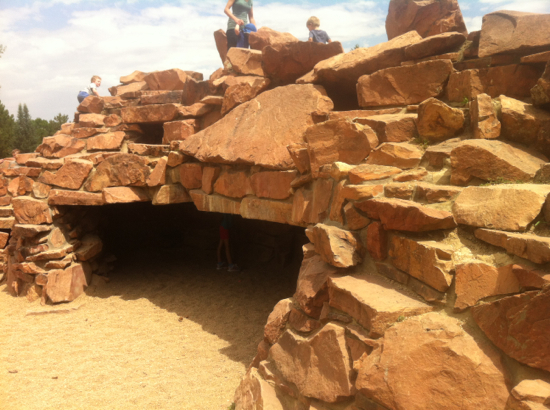 In complete contrast to modern synthetic playgrounds, the focal point of Cave Park has a beautiful flagstone play structure complete with tunnels and mazes, built right into the landscape. Cave Park provides such a unique experience for kids, as it's so completely different than the usual playground experience. It's a great way for kids of all ages to develop climbing skills, comfort level with dark and tight spaces, and a real sense of independence! There's really no hand holding through the tunnels, kids must explore on their own. Boulder is known for it's Open Space and Mountain Parks, but it's a bit of a hunt to find the playgrounds that are true gems. Through a series of posts, I am going to highlight some of our favorite parks to help cut out the legwork for anyone looking to go on a playground adventure, be it a local or just a visitor passing through! 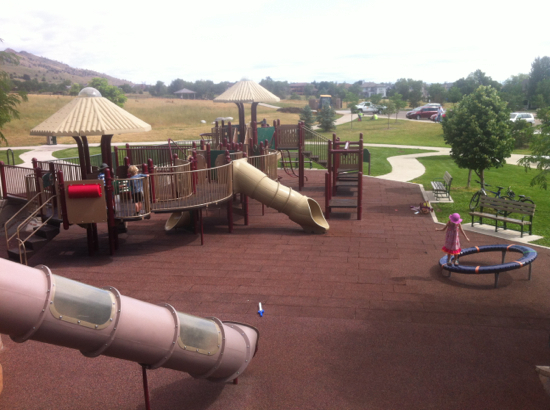 Foothills Community Park is a park complex in North Boulder, west of Broadway off of Cherry Avenue. The highlights of this post are from the playground that is featured off of 7th Avenue and can be tucked away from the Community Gardens portion of the Foothills Community Park (related, I couldn't find the playground until we went off searching on foot). My legs are long and dominate my physique, but come in handy as I gracefully throw the right one over the top tube of my Surly. My feet nonchalantly slip into the toe clips on my pedals and those dominating legs get to work. There really isn't much settling in when I hop on a bicycle, I feel at home. My hands gently squeeze the brakes when I am moving too swiftly down a hill. On a rare occasion, I let myself feel what it's like to just let it rip without touching the brakes. The wind passes through my helmet, I unknowingly crack a smile maintaining tight lips, fearing bugs would ruin my triumphant moment. My right hand doesn't have to wait for a message from my legs sent through my brain to adjust the gears on a climb, it just opens up the lever and the release is immediately felt. I love climbing, which may be rather strange to admit, but for some reason I enjoy hushing up all the tiny whispers that tell me I can't do it. When I climb, I can. Sharing A Laptop? That Was Easy! Reading Food Labels, Do Americans Have The Right That Consumers Have In 64 Countries? Labeling GMO's, A Debate. This is a great informative news segment: My favorite part of the video is when the representative of the grocery industry says consumers don't need to know if a product contains GMO's because they are safe and it's just a confusing label (as we would assume that makes them unsafe). I will follow up his statement with this, why as consumers do we need to know juice comes from concentrate? That's a label that is in place, do we assume concentrate is bad for our health? How Many? Just One, At The Bar. Dining Solo at Pizzeria Locale Boulder. Rather foolishly I assumed Pizzeria Locale wouldn't be crowded on a Sunday evening. I had barely thrown the parking brake in the truck, when the crowd loitering on the sidewalk in front of Locale caught my eye. A beautiful sign of summer is seeing the patio door fully retracted, allowing the most magical wafts of the union of dough, sauce, and cheese from their glorious wood fired oven outside, gracing the passersby. I may have stepped off of the sidewalk to avoid kids on bicycles, a few leashed dogs, and adults chatting away, gathered along the iron railing before arriving at the front door. I immediately scanned the bar to see if there was any space available before the host could even welcome me. Just one. I'll take the pizza bar.